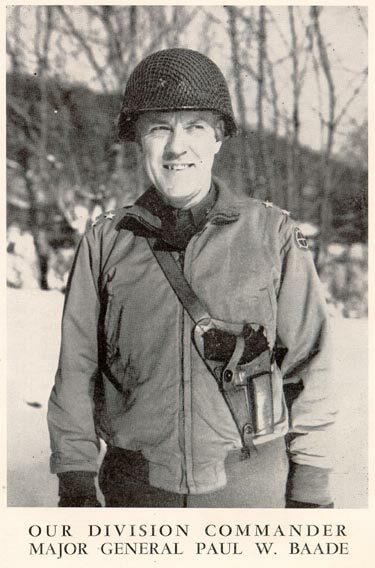 During World War II Winecoff fire survivor Paul Baade was commander of the 35th Infantry Division in Europe. His division saw almost continuous combat action during the eleven months that followed D-Day. 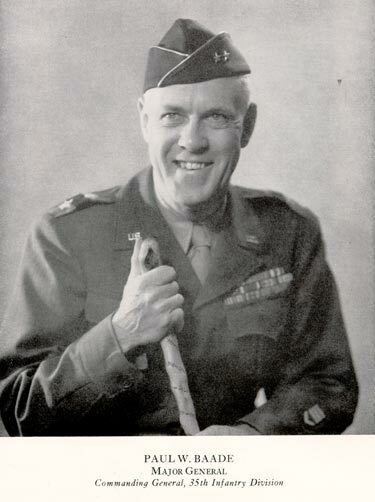 His wartime papers are housed at the Truman Library. A veteran of both World Wars, Paul Baade, 57, was sixty-eight days into retirement when he and wife Margaret were guests at Atlanta's Winecoff Hotel. "My wife and I were awakened to the screams of, 'help help'. We got up. I smelled a little smoke. I opened the door, found the hall full of smoke and realized we could only be saved out the window," Baade said. They were trapped - six stories up. Their corner room afforded a view of both Ellis Street and the back alley. Slowly the enormity of the event and the urgency of their situation within it became evident. Fire was below them and rising. A grueling period of uncertainty ensued. An aerial ladder was fully extended toward room 618. "When the ladder did arrive, it was only six inches on the window and how Mrs. Baade and myself got on and down is still a miracle," he said. Baade said of the Winecoff fire, "I have never seen anything worse than this in all of my experience in the war. There you have chance for an escape. You can lie down or you can move. Here you just had to wait."